Mama Monday: Date Night is a Must Do! I think a must do for any mama(or daddy) is to schedule a Kid’s Nite Out (in) and an adult night out! Date night is one of the best things for our entire family. Ideally I schedule ours for halfway through the trip. We do this for any trip that is six nights or longer. The kids get a quiet night in and some time to recharge and get a longer night’s sleep. The parents get some adult time and a chance to eat a meal without a character, and to not have to rush through eating. I always use Kid’s Nite Out. They are a sitter service that comes to your room. They have an exclusive with Disney so if you ask Disney who they recommend this will be who they give you. They background check their sitters and you can be very particular about your request. When my oldest was just a year old, I had very specific requirements and they honored them all. They show up in their purple shirt with a name tag. They can’t bathe the kids or take them to the pools but I don’t mind that. They also arrive with a ton of age appropriate toys that have already been cleaned along with some books. These were a big hit with our kids. Their rates are very reasonable at $18.50 per hour for two children. We leave one of our cells with the sitter for text and picture updates as needed. Then we are off! Our sitter’s name was coincidentally Melissa. She was fantastic and I highly recommend her! We went to Narcoose’s Friday for our date night. We took a cab over so it was like a real date night out. 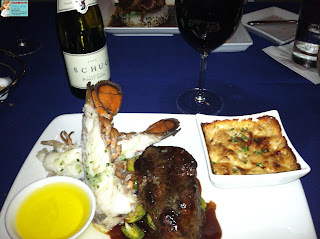 We enjoyed a leisurely meal with wine, appetizers, and entrees. This is one of our entrees. It was all delicious! And the restaurant even honored our request to be away from any tables with children. We were polite enough to leave ours at home for a later in the evening reservation. We skipped desert and decided to go into Epcot for extra magic hours. We returned home to children already snug in their beds, the dishes cleaned up, and everyone happy. This morning our oldest even asked where the sitter was and if she was coming back! I make recommendations like these and more for my clients.